Over nine days, festivities will take over the city streets and thousands of people will meet on the streets to enjoy the good atmosphere and the numerous cultural activities available on the festivities' programme. It was in 1978 that several associations from Bilbao decided to organise a contest of ideas to create a Big Week in Bilbao, as up to that date only a few scattered activities of little importance for the citizens used to take place in Bilbao. So, "Aste Nagusia de Bilbao" (Bilbao's Big Week) originated. After more than 30 years it has turned into one of the most popular and most visited festivities in Euskadi. This year the fiestas will kick off on Aug. 18th to finish on Aug. 26th. Following the mythical "txupinazo" (burst of fireworks that announces the start of the festivities) and the opening speech, the peculiar Marijaia, symbol of the festivities, will look out of the balcony of the Arriaga Theatre to give way to the celebrations. On the last day of the festivities, Marijaia will once more be the leading figure. 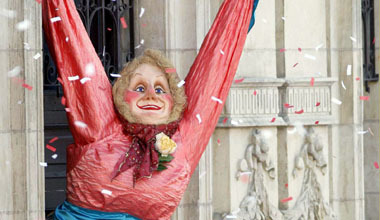 The peculiar character will be burnt in the square of the Arriaga theatre, in from of hundreds of spectators, thus marking the end of the "Aste Nagusia de Bilbao" (Bilbao's Big Week).